if you ever have cause to travel on a citylink bus between buchanan street bus station in glasgow, to the ferry terminal for islay at kennacraig (or even in the opposite direction), you will have driven through the tiny italian village of furnace. though ostensibly pronounced exactly as written and equated with that with which metals are smelted, some amongst us have opted to bestow an italian flavour by pronouncing it furn-a-chay. well, the bicycle currently standing to attention in thewashingmachinepost bikeshed has emblazoned about its regions, the word aszure. likely pronounced in similar fashion to the word for a particular shade of blue, to provide it with more of an italian flavour, i have decided to add a hypothetical acute to the letter e: az-your-ay. 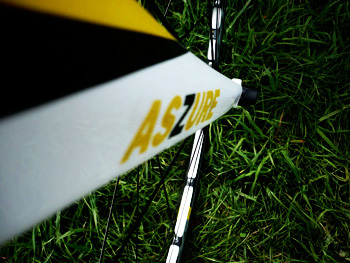 few and far between are modern day carbon frames made from tubes and lugs; the aszure is no exception. fabricated in the far east, it's a well made monocoque, the only evidence of the join, as eric morecambe would have said, is along the top of the chainstays. 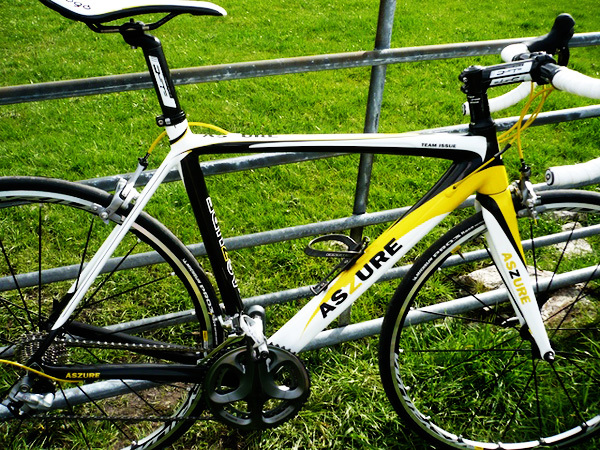 the aszure frame is commendably tight, appearing compact yet substantial at the same time. it's hard to deny that the bulk of this bulk is imposed by means of a large downtube. it's very squar(ish) with a completely flat area facing downwards. in my opinion, a very large downtube. providing the real estate for affixation of same is a tapered headtube, marrying to a tapered (carbon) steerer. in keeping with modernity, the team issue features a semi-integrated headset widening from 1.125" at the top to 1.25" at the merging of the lower portion to the substantial crown of the carbon forks. the cabling thankfully now running under the bar tape has jagwire written all over it, and features a really cute solution i've never seen before (i lead a sheltered life). gear and brake cable outers have an annoying knack of scraping away portions of that lovingly applied paint that i don't like much, to leave rough, naked carbon. the current solution is to apply round pieces of clear plastic to the frame, but jagwire have placed rubber gaskets over the cables which provide the necessary protection and can be slid up and down until protection is accurately placed. the modernity of the frame design, and underlining that this is a new company intent on matching current standards, stretches to the current trend for internal cable routing. 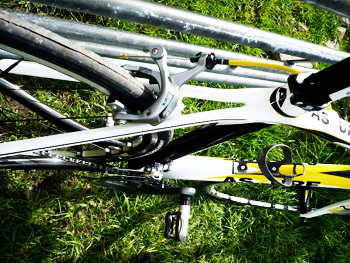 the rear brake cable enters at the front of the top tube and pops out just ahead of the seat tube. both front and rear gear cables plunge inside that enormous down tube just aft of the head tube, emerging from the underside of the tube just ahead of the bottom bracket area. the rear mech cable however, travels along the exterior underside of the right-hand chainstay, before clamping into that rear gear mech. that ruddy great downtube has to go somewhere, and that somewhere incorporates press-fit bottom bracket bearings; a bb90. i have long hassled the engineers of the bicycle world with my tirades over their tinkering with this area of the bike, churning out more varieties than seem strictly necessary, though all headed towards providing more stiffness than one amateur could practically manage. however, from a purely aesthetic viewpoint, this arrangement is most pleasing. we'll come to the reality of its inclusion later. 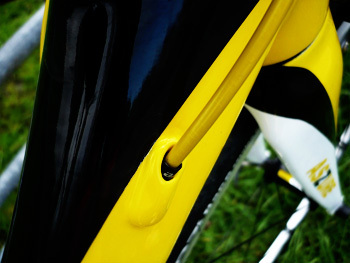 the seat tube is possibly the most standard looking tube on the frame, while the top tube is in full agreement with its compatriot the downtube to the front of the frame. the top of the former almost manages to flatten itself out, but maintains a pleasing compromise between flat and round, while all the while tapering towards the seat tube. the seatstays don't quite make it to emulating a wishbone, but make a decent attempt on approach to the brake bridge before heading off to meet those substantially squared chainstays. cursory glances prior to riding, impart a knowledge that can only be borne out by pedalling the darned thing, but based on this degree of superficiality, there can be little mistaking that if cut in half at this point, the cross-section would spell out the word 'stiff'. the yellow, white and black colour scheme is distinctly unremarkable, and to my mind would not be hard to improve upon. however, it would be unfair to level solo criticism at aszure, since the faux htc high-road colouring is no worse than that on offer from many of the world's major brands. i console myself that it's a phase they're all going through; someday they'll all see sense. a plain carbon frame would be nice, since the few hints (the black portions of the colour scheme are bare carbon) are particularly appealing. the build kit as supplied does not in any way disgrace itself. that substantial, tapered head tube is filled with an fsa headset which is complemented by stem and bars from fsa's team issue range, sporting a neat marbled carbon finish. 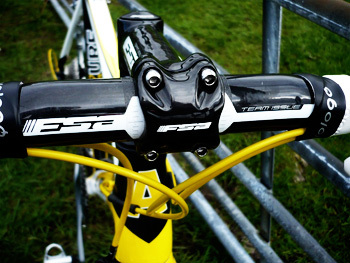 both stem and bars are of forged alloy with a carbon wrap, as is the team issue seatpost. the saddle, as well as the white bar tape is provided by prologo. mavic, version one r-sys recall aside, have an all but impeccable reputation for excellent wheels, rims and hubs; a pair of silver ksyrium elites are in my opinion, an excellent and economic choice. with 18 radial spokes up front and 20 built radial non-drive, two cross on the drive side at the rear, 1550g per pair is ideal for a performance bicycle. 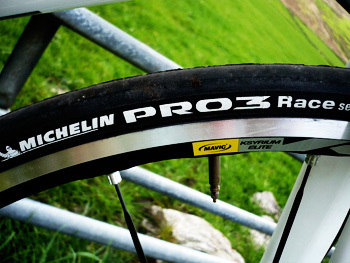 tyres are michelin pro race 3, completely devoid of tread. interestingly, pro race 3 tyres are available in nine different colours, and i did ask myself on more than one occasion why the black and yellow version had not been fitted to those ksyriums (ksyria?). it is almost unheard of for any bicycle to arrive with pedals, so i fitted my own pair of mavic sprint pedals. the first rule of bicycle reviewing is never review a make you've never heard of and the second rule of bicycle reviewing is screw rule number one. every bike ride has to start somewhere, and my advancing years lean strongly towards flatter topography for those initial kilometres; that could easily have been a problem. the aszure team issue was apparently too small. not as regards any height adjustment - there was masses of seatpost to play with - but perceptibly in top tube length. my cielo leads my arms almost 55cm away from my bum, and even the colnago master has around 54cm to play with. the aszure, if my measuring was anywhere near accurate (it's very hard to find the centre of a modern carbon headtube) seemed nearer 53 to 54, and a 120mm stem was 10mm shy of my regular position. perceptions, however, can be somewhat misleading. though visually the drop from saddle to stem seemed larger than was likely to be comfortable, in practice all was exceedingly well. and since i've always had a problem with numbers, those constituting that top tube mirage didn't add up to the lack of cockpit room i'd anticipated. 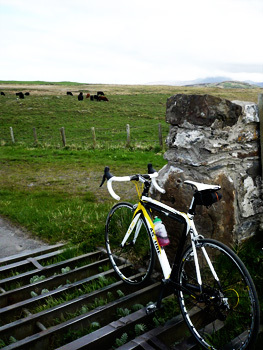 do not get me wrong; another centimetre or so on the top tube would not have gone unheralded, but there was less wrong in the state of argyll than had been portended. but to return to that unflinching topography that introduced bike to rider and vice versa. a dead straight ride of 15km, followed by a less direct 12km but more rolling return along a parallel by-way, proved little other than the aszure was a perfectly decent bike. there are any number of perfectly decent bikes in the world, and i could see little advantage in having introduced yet another to an exceedingly crowded market. that was, i'll now admit, until i turned off the high road onto the abattoirenberg forest. in common with many of britain's roads, islay's are falling to pieces. some of the dilapidation is as a result of a snowy and icy winter, but the abattoirenberg forest was unbridled purgatory before a single flake had fallen. 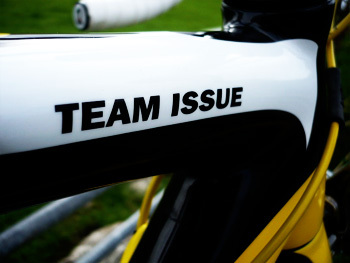 the team issue is favoured as a race bike (there really is a team to which these frames are issued), and the watchword of any carbon that might be asked to sprint for a line is stiff. it is a great favourite of argyll and bute roads department to douse perfectly appalling roads with apple crumble (more generally known, i believe, as surface dressing). quite why this is still regarded as an effective method of surface treatment is quite beyond me, for the minute it wears, everything becomes rumblestiltskin. the stiffness of that tapered head tube, substantial fork legs, colossal squared downtube and seemingly intractable chainstays, spent a large proportion of the journey recounting every tiny bump that fell under those pro race tyres. i don't wish to infer a total lack of comfort, because that would be an untruth, but i had leanings towards it being perhaps less comfortable than my litle bum desired. 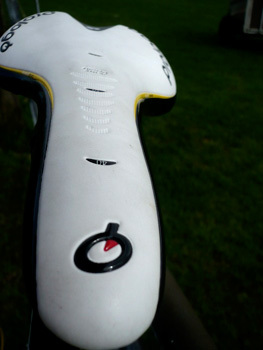 the one major link in the equation at which the blame could not be laid, was the prologo evo saddle which, despite a wafer thin profile, exuded more comfort than could have been reasonably expected. i have, hopefully, instilled an accurate portrayal of the roadway bisecting the abattoirenberg forest, one which was now approached with substantial temerity. yet here's where this high modulus carbon fibre becomes a mass of contradictions; in a very good way. there were times when the necessity for any sort of headset seemed a mite pointless. the patchwork of potholes could be seemingly successfully negotiated by simply leaning to either side. the bicycle response was instantaneous; in fact, it was probably a smidgeon quicker than its rider. based on my non-racer's point of view and total lack of experience in the world of fast, i thus denote this bicycle as a classics specialist rather than one that might inhabit three weeks of stage racing. islay is laced with a substantial network of single track roads travelling deep into the hinterlands, and regularly trammeled by tractors the size of small houses. they are not smooth by anyone's definition. but the aszure made them way more fun than they truly ought to be. allied to the gritty and twisting reality of agricultural country roads is the occasional necessity to ascend a rural gradient, perhaps just what that singularly enormous bottom bracket was designed to counter (for my sprinting ability was never likely to give it any cause for concern). resorting to my socially inept and wholly unscientific method of measuring rear triangle deflection, i closed the rear calipers as close as one dared, stuck it in the biggest gear my chris hoy thighs could manage, and lumped it up a hill. it will come as perhaps little surprise that the only movement was from the rider. stiffness does possess benefits, one of which is an unbridled forward movement when pedal stamping occurs. what the aszure does not provide, surprisingly, is that indefinable follow through at bottom dead centre of the crank rotation. this does not have enough import to reach the level of criticism; it is something i have always looked for as an indicator of superior frame design, but none of my previous candidates have sported a bottom bracket such as that seen here. and maybe that's just not supposed to happen. but the darned thing climbs alrighty. le carrabus l'arbre; roughly translated as the road of eternal crap. you can imagine my rush to traverse when this road takes on the characteristic of an obstacle between self and coffee. however, the approach consists of gravel, more gravel, belgian toothpaste, the occasional herd of cows, and more potholes per kilometre than currently allowed under european rules. it goes up and it goes down, making full use of gradients in excess of 10%, finishing off with a small bridge on a hairpin bend, a cattle grid and a descent that hides a road surface under yet more gravel. though i have yet to destroy anything while traversing such a concentrated five kilometres, i don't doubt there will be a first time. the pro race threes stick to everything, and coupled with the mavic ksyria, it's an easy trick to emulate bluetac. yet again, the contradiction manifests itself, for rarely have i had so much fun across this apology for a road, nor felt quite so much in control. you see, the build kit is a goody, the frame metaphorically hits the ground running at the first attempt, yet it's quite plainly not the lightest carbon that has crossed the threshold. yet saddled up and cleated in, you'd be hard-pushed to tell. even when climbing, the last thing of concern is any perceived extra weight. 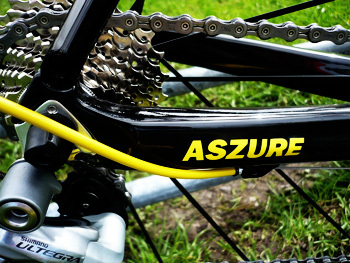 the aszure team issue is just crying out for a campagnolo groupset; don't ask me why, it just is. and even its previously castigated unsuitability as a traverser of smooth roads must be called into question. as the sharing of kilometres progressed, i had serious call to reconsider my earlier misapprehensions. head and shoulders shampoo once advertised to the effect that you never get a second chance to make a first impression. that's utter rubbish; the team issue has spent many a kilometre proving the disingenuity of such a remark. are there criticisms? well, yes, i'd be lying if i said otherwise, but they're hardly death-defying, and some aren't even aszure's fault. i've moaned above about the colour scheme; not so much the fact that it's yellow black and white; i can live with that. but i find it hard to become enthused over the dart shapes here, there and everywhere. simply a case of personal taste. 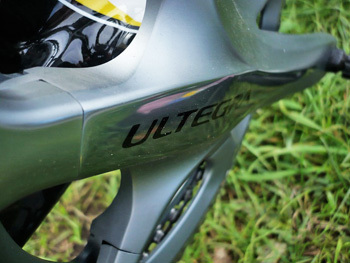 and that right side ultegra sti flip-lever. the travel required to drop down the block really is a flip too far particularly compared with the competition. the little lips built into the front dropouts have no place on a race ready bike (and i can find no concrete evidence that there is any legal requirement for them being there in the first place). and unless there are handily crafted internal spaghetti hoops inside those carbon tubes, i'd hate to be the one replacing gear or brake cables. i know it's a trend not confined to aszure, but it might just possibly be more about style than substance. introducing a brand new cycle brand to an overfed market would lose me a great deal of sleep, particularly when aiming straight for those bulging of wallet. the option to bring it slowly to the boil is, quite frankly, not an option. aszure have done their homework assiduously; this is as close to state of the art as could reasonably be expected for anyone's money; this is excitement you can afford. a truly superb debut. the retail cost of the bike as tested is £2600. the aszure team issue will be the subject of a follow-up review in a month or two.